SCSI (small computer system interface) cable assemblies are used to establish high-speed connections and enable data transfers between small computers and peripherals like printers, optical disks and hard disks. The assemblies have moulded covers, which ensure stable connections between devices. Foil or braided shields cover the assemblies to minimise interference. SCSI cable assemblies have either male to male, male to female or female to female connection configurations. 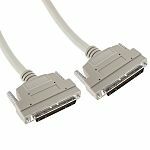 What are SCSI cable assemblies used for? SCSI cable assemblies are used in numerous applications including audio video, networking and telecommunications. Some SCSI cable assemblies are specifically designed for usage in high-vibration environments like industrial factories or manufacturing plants. Centronics connectors used for connecting most third-party peripherals. DB connectors with numerous pin variants to accommodate a wide range of external devices. High-speed serial data connectors, which facilitate top speed transfer rates. Telco connectors with high pin counts of up to fifty pins for connecting printing and scanning devices.